Englishman Christopher Wilcox—a self-described “visual dude” and “archivist”—always knew he would do something out of the ordinary. Wilcox’s predilection for conservation and creativity found its appropriate outlet in Natural Curiosities, his wonderland of an art house located in Los Angeles. A fully wholesale business, Natural Curiosities creates wall art, furniture, sculpture pieces and objets d’art that are sold at Harrods, Saks Fifth Avenue and other outlets as well as to the interior design trade. Natural Curiosities pieces, which explore themes of nature, can range from $45 for a small silk-screened print to several thousand dollars for a 72-inch square piece made of 3,000 gold-painted feathers arranged in a radiating pattern. Now in its 10th year of operation, Natural Curiosities—which employs about 25 conceptual artists and designers at its main Echo Park studio and about 50 artisans at a separate L.A. facility—serves more than 5,000 clients in 26 countries. A number of factors brought Wilcox to his concept. Growing up in rural England, he was exposed to natural beauty on a constant basis. In later years, he developed a visual fascination with nature and art, and with the help of digital scanning tools, amassed a collection of images from centuries past. He took this interest with him when, after living in London for eight years, he moved to L.A.
His personal archive has since grown to more than 100,000 books, images, specimens and other items. Natural Curiosities was derived from this portfolio. Natural Curiosities became known for its unique sensibility, with work landing on the pages of Architectural Digest and House & Home, among other print and online publications. 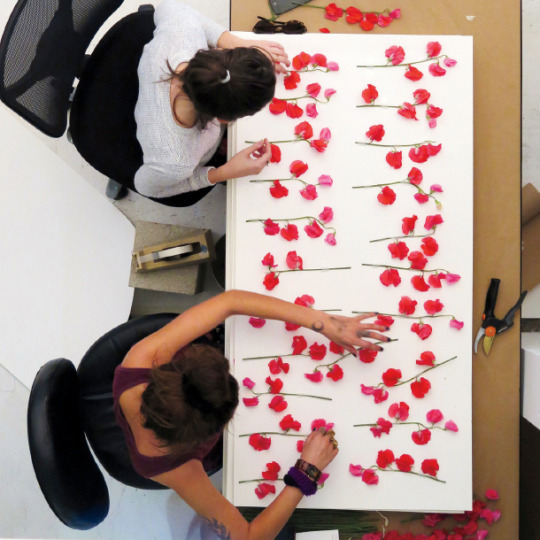 On any given day, in-house artists might be silk-screening patterns, gold-leafing rows of tiny hearts or pressing flowers. Creative energy fills Natural Curiosities’ 9,500-square-foot 1920s bowling-alley space up to the rafters. Photo shoots, film shoots and music recordings are not uncommon workplace occurrences. Now looking beyond wholesale, Natural Curiosities is evolving into a lifestyle company with a Californian-European aesthetic. Wilcox is expanding production into a 65,000-square-foot location and plans to offer a fashion line. He’s also developing a creative agency to work with artists, musicians and companies wanting to align their brand stories to natural themes in the form of videos or other visual narratives.